OfficeFIX portable bundles a set of tools intended for repairing corrupted Office documents and retrieving their content. The suite includes dedicated applications for recovering Word documents, Excel spreadsheets, Outlook mail files and Access databases. • Recovers the information from a corrupt Microsoft® Access database and saves into a new and trouble-free database. • Supports all versions of Microsoft® Access including Access 95, 97, 2000, 2002 (XP), 2003, 2007, 2010 and 2013. • Recovers tables, queries, forms, reports, macros, modules, indexes and relations. • Recovers records that have been deleted from a table. • Recovers all types of fields including autonumeric, replica ID and high precision numbers (Decimal). • Recovers MEMO and OLE fields. • Recovers texts, numbers, and formulas and saves the recovered data in a new trouble-free file. • Supports Microsoft® Excel 95, 97, 2000, 2002 (XP), 2003, 2007, 2010 and 2013. • Recovers formats, column widths, row heights, merged cells and more. • Recovers charts, bitmaps and other objects. • Recovers names, external references and multi-sheet ranges. 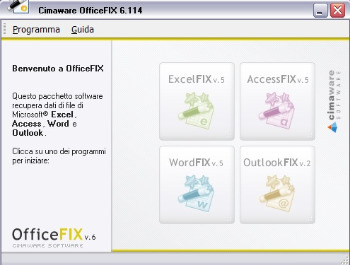 • Extracts the information from a corrupt Microsoft® Word document and saves it in new and trouble-free file. • Supports all versions of Microsoft® Word including Word 2007, 2003, 2002 (XP), 2000, 97, 95, 6.0, 2.0 and Word for Macintosh. • Safely repairs documents that have been infected by viruses. • Recovers page formatting (margins, page size, page orientation, page breaks, etc). • Recovers paragraph formatting (line spacing, border lines, alignment, etc). • Recovers font and style formatting (bold, italic, size, type, color, background, etc). • Recovers headers and footers, table of contents, glossaries, hyperlinks, bookmarks, lists. • Recovers Eastern languages as well as Greek, Hebrew, Cyrillic, Arabic, Thai and Lao. • Recovers damaged and corrupt Microsoft® Outlook PST files, including those that have exceeded the 2GB limit. • Supports all versions of Microsoft® Outlook including Outlook 95, 97, 2000, 2002 (XP), 2003, 2007, 2010 and 2013. • Repairs all properties in emails, contacts, calendar, notes and tasks (To, From, date, importance, etc.). • Restores deleted Outlook elements including emails, contacts, calendar, notes, attachments and tasks. • Recovers files that have exceeded the 2GB limit. • Allows you to split large PST files into several smaller ones, reducing the file size. • Recovers attachments, including documents and images attached to emails or embedded into the HTML body. • Recovers password protected files. • OutlookFIX recovers all elements: emails, contacts, calendar items, notes and tasks.